Nissan North America announced today that it is recalling 392 model year 2013 Nissan Sentra vehicles because of a fuel tank issue. Affected vehicles may have been equipped with an improperly sealed fuel tank assembly, which may result in a gasoline leak if the tank is full. Such an occurrence could lead to a fire when in the presence of an ignition source. Affected 2013 Nissan Sentra vehicles were manufactured from September 11, 2012 to October 4, 2012 at the automaker’s Aguascalientes, Mexico plant. No other Nissan or Infiniti models are affected by Monday’s recall because the production line used to assembly the fuel tank is unique to the 2013 Sentra. Nissan will begin notifying owners and dealers of the recall on March 18, 2013. Authorized dealers will replace the fuel tanks, free of charge. In the meantime, drivers can contact Nissan Customer Service at 1-800-647-7261. Concerned customers may also contact the National Highway Traffic Safety Administration’s Vehicle Safety Hotline at 1-888-327-4236 or visit www.safercar.gov. According to documents filed with the NHTSA, Nissan first became aware of a potential fuel tank problem in November 2012 when it received its first warranty claim. The automaker then launched an investigation and determined that its fuel tank supplier, Kautex, was at fault. Kautex eventually concluded that certain fuel tanks were not fully sealed during the molding process, which may lead to fuel leakage. Nissan also recalled the 2013 Sentra on Monday over a passenger airbag defect. The recall, which also affects 2013 Nissan Altima, LEAF, Pathfinder and Infinti JX35 vehicles, stems from a passenger Occupant Detection System (ODS) problem, which may result airbag suppression. Nissan has not yet determined the total number of vehicles impacted by the safety recall. The Nissan Sentra is Nissan’s third best-selling model so far in 2013, with over 19,000 units sold. 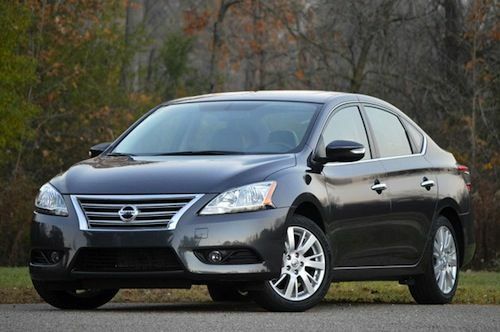 Only the Nissan Altima and Versa have sold more vehicles. Introduced in 1982, the Nissan Sentra was originally marketed as a subcompact entry-level vehicle, but has since grown into a more refined compact car. Now in its seventh generation, the 2013 Sentra boasts a complete redesign, including LED tail lamps, LED accents in the headlamps, and a new navigation system. Performance-wise, the 2013 Sentra features the new MRA8DE 1.8-liter 16-valve DOHC inline 4-cyclinder engine, which gets an EPA-estimated 30 mpg city/39 mpg highway. All trim options are equipped with a redesigned CVT transmission, except the S model, which contains a 6-speed manual transmission.